As we have seen, there is a multitude of possible BCI form factors—each with advantages, disadvantages, and purposes. In the consumer market, the most popular form factor is the headset. OEMs choose headsets more often over other form factors because they lend themselves to more interesting and aesthetic expressions better tied to a particular brand image or product category. For instance, the Uncle Milton Force Trainer’s headset was designed to yield the same look and feel as the Star Wars technology shown in the films. 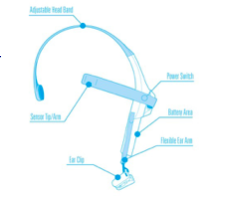 In today’s blog, we will uncover the basic components of a consumer BCI headset to eliminate much of the mystery surrounding it, and to demonstrate how simple it is to design one. Harness or Shell: The purpose of this molded piece of plastic or other flexible material is three-fold: (1) to hold the apparatus onto the user’s head, (2) to support the functional elements of the device, and (3) to position the sensor electrode(s) to the proper head locations. Most shells have adjustable arms and bands to allow them to fit various head sizes and shapes. Sensor Electronics: The sensor electronics built into the BCI headset capture and filter the raw brainwave signal. It is either a silicon chip or module sub-assembly located inside the headset cavity. How much processing power is built into the sensor board by the component manufacturer (e.g. NeuroSky and others) is a cost versus functionality trade-off decision, and greatly influences the type of markets to which the product is best suited. Consumer BCI solutions generally employ lower cost sensors inside the headset (to meet consumer price points) to perform capturing and filtering functions, and rely on some host platform to do the heavy lifting for the more intensive data calculations. 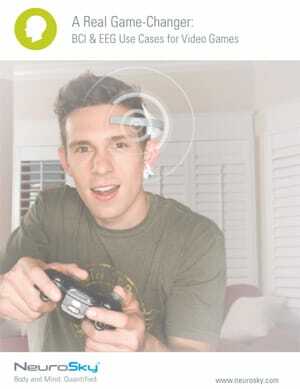 MCU (optional): Some headset OEMs whose products must communicate to a host platform that denies the use of its processor for BCI data calculations (such as a toy platform or a highly optimized mobile gaming device) may incorporate an additional MCU (master control unit) processor board into the headset cavity to take on this burden. This will, inevitably, add costs to the headset. Sensor (Channel) Electrode(s): Electrodes that are placed onto the head to specifically capture brain signal must be integrated into the headset. The more electrodes, the more complex, expensive, and difficult to use the headset becomes, yet the more data (granularity) can be captured and analyzed. Ground and Reference Electrodes: Some electrodes are used to capture areas of the user’s head where there are no brain signals. These locations are usually reserved for the reference electrode (while the ground electrode can be place anywhere on the head) to complete the EEG “circuit.” In many cases, these electrodes are built into ear clips which users place on their earlobes. There are other alternatives beyond the ear clip that we will discuss in our next blog. Communication Electronics: One of the major transformations that contributed to EEG’s medical-to-consumer revolution was the introduction of wireless communication technology (e.g. Zigbee, Bluetooth). This shift eliminated the reliance on tethered (wired) solutions. Medical EEG technology still relies on tethered systems even today, but consumer BCI—with scaled-down data demands—enabled wireless protocols to enter into the picture and set the stage for mobile BCI products which were better attuned to our everyday lifestyles. Power Source / Switches / Charging Port (optional): All electronics require a power source. Today’s BCI headsets are often powered by AA, AAA, or lithium-ion batteries. If the power source is rechargeable, then an additional charging port (e.g. USB) will also be required. An On/Off switch powers up the headset and, oftentimes, may serve additional functions such as Bluetooth pairing or mode setting. Wiring / Shielding: Connecting the various electrodes, circuit boards, power sources, and switches together requires the proper type of wiring and shielding to prevent additional noise introductions as the data signals are passed. The best headset designs hide the wiring by designing hollow cavities into the plastic shell for proper routing.